The Acqualina Resort and Spa is a slice of Mediterranean charm and haute living in Miami Beach. There’s plenty to love, from gourmet restaurants to an award-winning spa, but before all that, it gets the basics right. 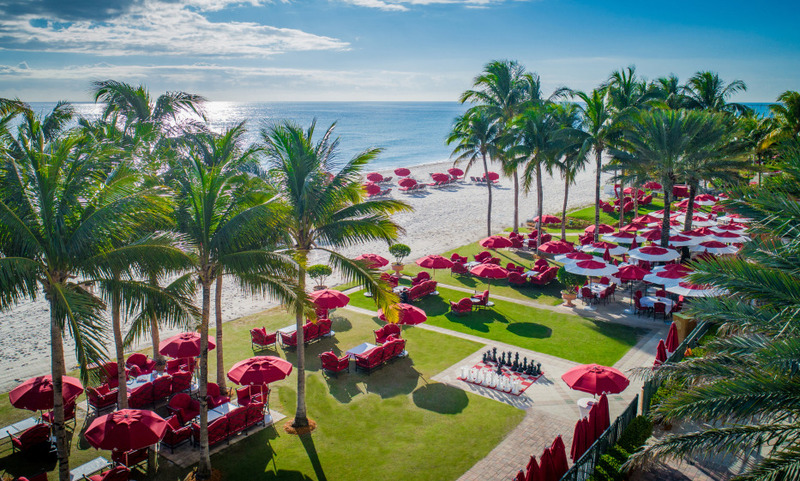 Unlike many hotels on Miami beach, which require a hop and skip across hot sand to get to the sea, the Acqualina Resort and Spa earns its beachfront title by practically merging with the water. Only a thin strip of sand speckled with lounges, bright red beach umbrellas and water toting butlers separate you from the cool waters of the Atlantic. Then, there’s the pools, three of them, all with poolside restaurants and cabanas to retreat to for extra privacy. The spa is nothing less than the first ESPA in North America. Treatments run the gamut, from exotic massages using Himalayan salt stones to blissful three-hour-long massage experiences. As for the cuisine, three restaurants vie for your attention, but the undeniable ace in the hole, is Michele Mazza’s Il Mulino, (yes, the same as in New York ) and the classic Italian dishes it churns out are as exceptional as you expect them to be…. Try the 20,000 sqft ESPA award-winning oceanfront spa setting new standards of design, spa innovation, luxury, and unforgettable experiences. In full view of the Atlantic Ocean, the four swimming pools are each a sparkling oasis of cool, refreshing enjoyment. Wouldn't stay anywhere else! Planning to go back in the future. We have stayed here several times. World class property. Loved the resort, we spent our time in the adult pool area, it was so nice, the attendants were very helpful and welcoming, your treated like an adult, not like a child, no time limit on the pools...awesome.. The hotel is fantastic, the staff lovely and very caring. The spa treatment was one of the best … One little thing. Maybe the serves at the restaurant Il Mulino are a bit too much. But otherwise, it’s an experience to repeat! Great hotel, with a perfect location. Service is world class and the food is outstanding.